Lime dosing in utility applications poses particular challenges for the pumps that are used in the process, and recent times have seen an increase in the use of peristaltic pumps for this application. Here we look at the reasons for this increasing popularity and examine some of the benefi ts which a peristaltic pump can provide for this duty. Treating wastewater is an essential step in both protecting the environment into which it will eventually be discharged, and avoiding the wrath of the local authorities who protect that environment. A typical biological treatment involves the use of lime chemicals that are mixed with water to produce a slurry. This is then added to the wastewater, so that any organic elements are removed and the water’s pH and alkalinity are controlled. The lime needs to be added in carefully measured doses so that the pH and alkalinity of the water can be maintained at the correct levels, and this makes specific demands on the dosing pumps. The primary reason for this is that although different lime compounds are used for diff erent purposes, they all share the same characteristics of being both abrasive and chemically aggressive, albeit to different degrees. Progressing cavity pumps have previously been a popular choice for this type of lime dosing application, which is perhaps surprising when you consider how vulnerable they are to the damaging effects of abrasion caused by the solid particles in the lime. This type of pump operates by rotating a helically shaped rotor inside a specially confi gured stator. This causes the rotor to seal against the stator and create a series of identically sized cavities between the two. The cavities fill with the medium being pumped - in this case the lime compound - and as the rotor rotates the cavities progress along the pump and transfer the lime to the point of discharge. Unfortunately, the interference fit between the rotor and stator, combined with the constant movement of one against the other, creates considerable potential for wear to occur. With an abrasive medium such as lime it is often not long before the speed of rotation needs to be increased in order to maintain the required lime dosing capacity. The pump then enters into a vicious circle where the increasing rotation causes more and more wear, which then creates the need for an ever faster rotation speed. Replacement parts are soon called for and an expensive maintenance routine quickly becomes the norm, and this causes the lifetime costs of the pump to rise dramatically. It’s not just progressing cavity pumps that suff er from this problem either, especially where abrasive media such as lime are involved. Other pumps designs can suffer from component failure, leakage and clogging if they are allowed to run dry. These sort of operational problems and lifetime cost penalties are one of the reasons why increasing number of endusers are now recognising the benefi ts of a peristaltic pump for lime dosing applications – or indeed for many other types of duties where abrasive media are involved. The key to the peristaltic’s popularity lies in its unique method of operation. This involves subjecting a fl exible tube to a constant process of alternating compression and relaxation. Operating in a similar way that in which the human throat and intestines function, this drives the fluid through the pump. The peristaltic pump uses a precision extruded fl exible tube (or a heavy-duty hose for more demanding applications) into which the pumped media is drawn at one end. A series of rotating rollers then move along the length of the tube, compressing it where they touch to create a reliable seal between the suction and discharge ends of the tube. The rollers trap the pumped liquid between them, and as they move along the tube they create a positive displacement action which carries the pumped fl uid through the tube smoothly and easily. As the rollers move they gradually release each compressed section of the tube which then regains its original shape. As they do this they create a vacuum in the tube, allowing a process known as peristalsis to draw more product into the tube at the suction end. The key factor here is that the pumped medium – the lime compound – is always contained within the tube and never allowed to come into contact with any of the pump’s moving parts. There are no valves, glands or seals for the lime to aff ect, and these are the features which often represent the weak points on other pump types used in lime dosing applications. The result is that on a particularly demanding duty such as this, a peristaltic pump eliminates much of the process downtime and maintenance costs that can be expected from the progressing cavity pump (or many other types). 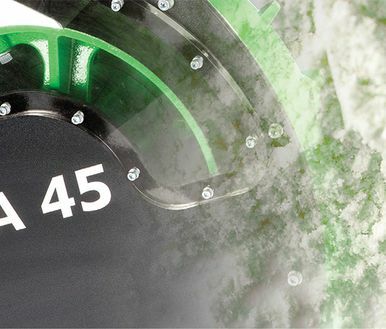 Peristaltic pumps that have been used for lime dosing have been examined and found to be entirely free of damage as much as six months after the date of installation, but that is only the first of the peristaltic’s many benefi ts. The only component that may need to be replaced with any sort of frequency will be the fl exible hose. This can usually be accomplished in around 90 minutes and it eff ectively returns the pump to ‘as new’ condition. Creating the same eff ect on a progressing cavity pump takes far longer as it often entails replacing many components including the seal, coupling rod, rotor and stator. Not only does this significantly increase the maintenance time required, it also adds considerably to the spares stock holding requirements for the end-user. A recent report by the Water Research Council confi rmed the suitability of peristaltic pumps to lime dosing duties. Among the benefi ts which led the Council to this conclusion is the ability of the peristaltic pump to resist the problem of lime coating. Because the lime chemical is typically held in suspension (rather than actually being dissolved in the water) it is able to fall out of suspension, especially in any areas of the process where low fl ow velocities are experienced. The lime then begins to coat any surface it comes into contact with, and as this coating becomes hard and settles on mechanical parts such as rotors and stators, it increasingly restricts the pump’s ability to function effectively. The coating becomes thicker over time and the performance of the pump involved suffers even more. The seals used with progressing cavity pumps are especially susceptible to this problem as the lime coating will cause the seal spring mechanisms to clog up. The seal faces will be abraded by the lime particles, and then the pump is stopped, the lime solution tends to dry out on the seal faces and cause them to stick together. Even traditional metering pumps that employ ball valves can suffer badly in this situation as the ball valves and seats become choked with lime. Without the need for any complicated sealing or ball valve arrangements, the peristaltic pump eliminates these problems. Fortunately for peristaltic pump operators, the movement of the tube or hose provides another benefit. The constant flexing of the tube prevents any lime coating from taking hold in the first place, and it also eliminates the need for cleaning to combat the problem. As a peristaltic is usually connected to flexible discharge hose, this benefit also extends beyond the pump, whose gently pulsing action causes the discharge hoses to flex constantly and once again this prevents any lime coating beginning to build up here. On the subject of hoses, it’s always advisable to deal with a manufacturer such as Verder who only use hoses that are made from 100% natural rubber, thus making them completely resistant to attack from the chemically aggressive lime compounds. It’s also well worth ensuring that, as with a Verder peristaltic pump, and flange connections are made from stainless steel which provides them with the same resistance to chemical attack. One of the key requirements for lime duties is the ability deliver accurately measured doses on a reliable basis, and this is another area where the peristaltic pump scores highly. Modern in-line measurement equipment makes it easy to gauge the pH of the process and assess whether or not the correct lime doses are being added. As the dosing capacity of a peristaltic is directly proportionate to its operating speed, feeding the output of the measuring equipment to the pump’s control system allows its speed can be constantly varied. This ensures that accurate dosing is delivered at all times and it allows the treatment plant to accommodate the regular changes in demand which it encounters at different times of the day. With this type of holistic benefit in mind, working with a peristaltic pump supplier such as Verder pays other dividends as they can provide and install full turnkey systems. These can include pumps in duty/standby configurations, plus the necessary control systems, housing and associated pipework, all combined into a fully integrated and reliable pumping solution. The advantages we’ve covered so far make a convincing case for peristaltic pumps in lime dosing. However, if more proof is needed, we should consider that although the peristaltic’s initial purchase price might be higher than a progressing cavity pump, a single peristaltic can often be used to replace a two-stage progressing cavity pump solution without any loss of performance. Viewed in this context the initial purchase price becomes very attractive, and the fi nancial benefi ts go from this point right through the lifetime of the peristaltic pump as it off ers significantly reduced maintenance and spares requirement, lower downtime and in some instances, lower power requirements too. On a more general note, it’s worth remembering that in addition to lime chemicals, the versatility of peristaltic pump means they can be used to handle a wide range of other fl uids, ranging from difficult abrasive substances such as clays and slurries through to clean and sterile liquids. Their gentle pumping action means that they are also perfect for use with the sort of shear-sensitive fl occulant polymers that are used in water and wastewater treatment processes. They can handle media with up to 80% solids content, and with specific gravities of 1.8 and above, so thick, dense fluids present no problem. Unlike some types of pump they may also be operated continuously without any problems, meaning that process operations do not need to be interrupted. With today’s ever-increasing focus on green performance and environmental matters its reassuring to know that the peristaltic pump also comes out in front in terms of performance. The pump’s flexible tubing is housed in a bath which holds the lubricant that is used to ensure the rollers pass smoothly along the tube. In the unlikely event of any lime chemicals leaking from the hose, they will enter the lubricant bath where they are still fi rmly contained within the pump housing. Unlike a progressing cavity pump, this prevents any possibility of the lime being lost into the surrounding environment, and the peristaltic can even be fitted with a gauge which detects any increase in lubricant volume and provides and early warning of any leakage. Where such a precise process as lime dosing is involved, it makes good sense to choose the only type of ump that can off er benefi ts at every stage of the process, and to work with a manufacturer such as Verder who has a proven track record in this area. Lime dosing is a critical element in the wastewater treatment process, so you cannot aff ord to make a wrong decision!